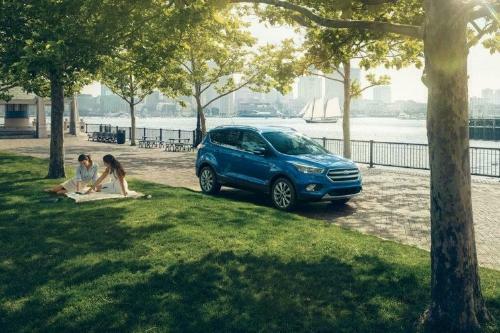 Sleek design and impressive efficiency make the 2017 Ford Escape S a smart choice for families. This four-door SUV seats five with ample cargo space and modern amenities. As the base level model, the S is both affordable and stylish to suit all of your needs. Sporty lines create an athletic appearance for the 2017 Ford Escape S as evidenced by the body-colour rear spoiler. A black upper and lower grille, black beltline moulding and black mirrors create an interesting contrast from the various body colours available. Integrated blind spot mirrors enhance visibility and help to prevent accidents whenever you want to switch lanes. Add roof rails and crossbars so you can carry more stuff. Enjoy privacy glass on the rear doors, keeping your family safe and comfortable. 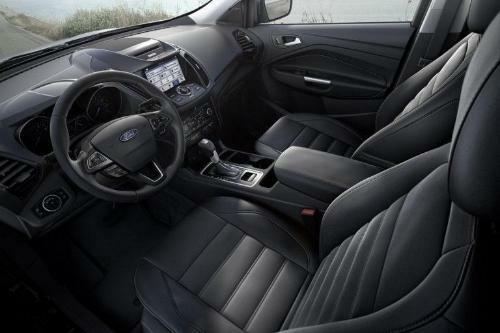 On the inside, the 2017 Ford Escape S reveals an intricate attention to detail with an emphasis on functionality. Surround yourself with modern luxury, such as with the Ice Blue interior lighting and ergonomic layout. Cloth front bucket seats are available, including a manual adjust for the driver’s seat. Power windows and doors provide convenience as the urethane steering wheel with cruise and audio controls enable you to keep your hands on the wheel while you adjust your settings. This trim comes with manual air conditioning, but you can upgrade to the dual-zone automatic climate control for an ability to set and maintain two different front temperatures at the same time. Enjoy every journey in the 2017 Ford Escape S as it delivers advanced technological features for an enhanced experience everywhere you go. Through the SYNC infotainment system, which comes standard on this model, you are able to listen to a variety of your favourite tunes through the audio system and CD player which features six speakers for clear sound. SYNC also provides you with an ability to access your compatible devices for hands-free calling and a focused driving environment. All genuine Ford accessories work with the 2017 Ford Escape S and provide an accurate fit for a remarkable driving experience. Take advantage of features such as splash guards and the unique covers that are available for added protection. Add roof racks to your model so that you can carry more cargo and stow larger or awkward items. Inside, cargo organizers ensure you have enough space for passengers as well as your stuff while remaining organized. Experience enough power for every journey in the 2017 Ford Escape S. This model offers two engine options, including an EcoBoost engine to provide greater efficiency. Driving this SUV is easy with torque vectoring control and traction control to keep you moving forward and on all fours. While front-wheel drive comes standard, you do have the option of adding the intelligent four-wheel drive system for increased stability and power in tricky situations. Electric power-assisted steering makes it easier to handle those curves and turns that come your way, resulting in a more confident on-road experience. The 2017 Ford Escape S is following a strong Ford tradition. 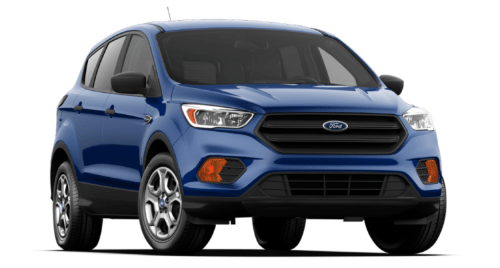 Feel secure wherever you go, knowing you are well-equipped with safety features in the 2017 Ford Escape S.
Every 2017 Ford Escape S comes with a sound Ford warranty. Take your family wherever they need to go in the comfort of the 2017 Ford Escape S. This model is ideal for the budget-conscious person who wants more comfort and convenience features. Add in efficient performance and the option of all-wheel drive, and you’ll understand why this model is so appealing. Stop by Watkin Motors Ford to see the 2017 Ford Escape S in person. Learn all about what it has to offer. While you’re visiting your local Vernon Ford Dealer – Watkin Motors Ford, you can see all of our vast Ford inventory in stock to select the vehicle that best fits your needs.